CGOA Conference and Show Floor, Concord North Carolina. Fall 2013 Show. 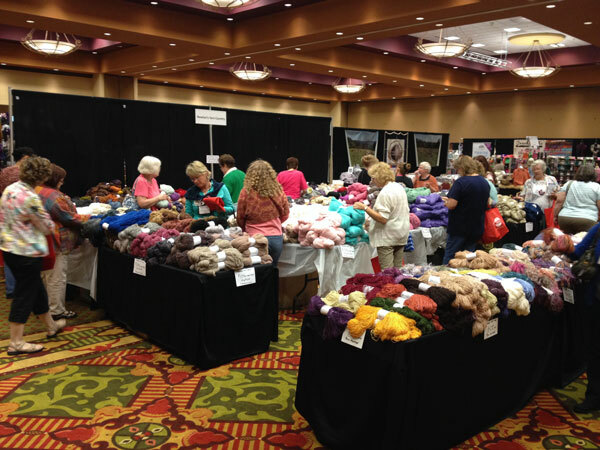 On October 3rd – 6th, 2013, the annual CGOA’s Knit & Crochet Show took place at the Embassy Suits Hotel & Conference Centre in Concord, North Carolina. 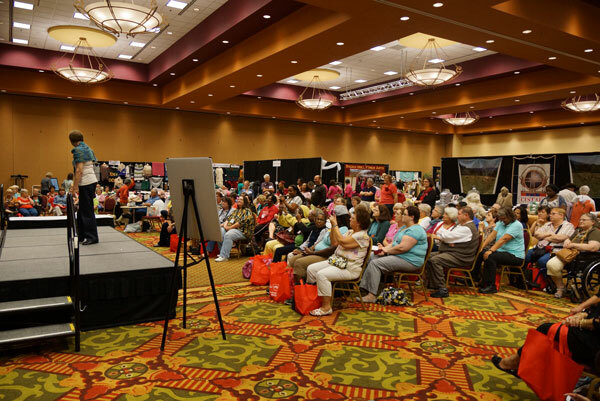 Crochet professionals, industry experts and companies come together for seminars for improving business and professional skills as well as networking with people who have influence. Members and Non-Members can take advantage of courses to learn more skills within the knitting and crochet world. Show floor of products brought together for people to show, learn and explore new ideas. This is open to the public. List of exhibitors who attended this show are at the bottom of this article. I wanted to meet up with my mentors at Red Heart. I wanted to meet and work with Amy Shelton & Donna Hulka at the Crochetville booth. I wanted to see the difference between a Canadian Consumer Show verses an American Consumer show. Daniel and I had gone down to North Carolina to offer our assistance. We are no strangers to help setting up consumer show booths. Remarkably, with the entire team of us, we managed to get the entire 40 foot x 10 foot booth set up, merchandised and ready all in 5 hours. Apparently it’s the fastest they have ever set up a show. When you finish writing a book for submissions to a publisher, the work is just beginning. True time and potential costs for creating a pattern book. Self promotion and responsibilities of a designer throughout the process. 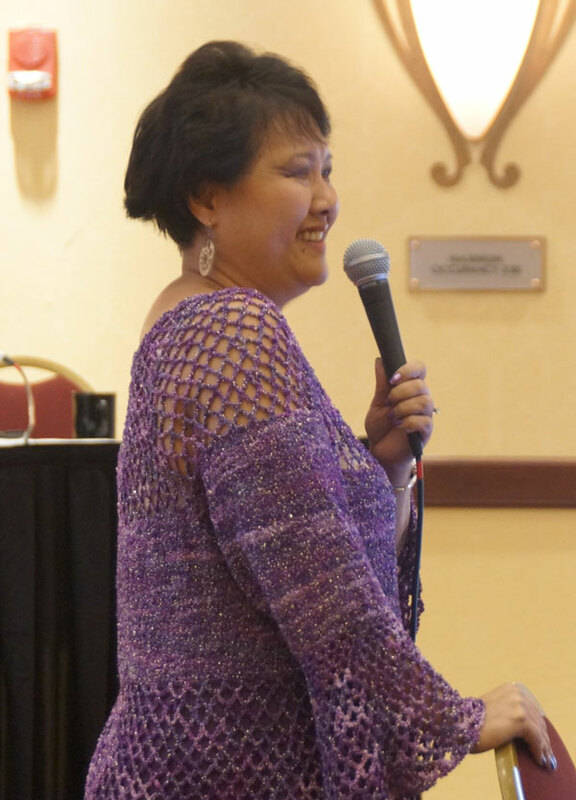 Lily Chin, most Entertaining Presenter at the CGOA, Knit & Crochet Crowd in Concord, North Carolina. Most of all, I learned that I am no where near ready to even think about being a published designer. My lack of time is my biggest factor for road blocking me in this area. So for now, I am not going to even think about this as my future at this time. In some of the areas that were discussed, my own skills and knowledge I have picked up through endless research on my own, were equal to or, in some cases, excelling over the speaker at the podium. I don’t think this is abnormal. We each have experiences depending on what our interests and fields of study are. Some of the advice that was given wouldn’t be advice I would have shared because on a half hour time limit, other key elements of advice would have been more valuable and helpful to the room as a whole. I probably would have been struggling as well to determine key points with such a quick presentation myself. Through informal feedback with others, some of these same thoughts were shared between people. Having said that, over all the advice I did learn throughout the day helped me greatly to alter goals or make new goals for myself. Of all the presenters, the one to make me laugh the most and connect with was Lily Chin from New York. I have heard she is an unpredictable speaker with humour mixed in. I wasn’t disappointed and I enjoyed every word she shared. She knows about shameless self promotion and as a YouTube Host, I have to have that trait. I also felt Vashti Braha of Designing Vashti connected with my thoughts on newsletter creation and out reach to consumers / community members. A half hour isn’t really long enough to share insider tips in this area of social media. She did a great job considering the time restraints she had. 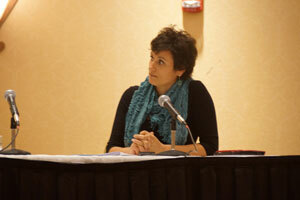 Jennifer Hansen was our MC for this all day seminar. Can I say that she was incredible? She really kept an eye on the clock and did a graceful job of cutting off a speaker when their time was up. At the end of each presenters’ spiel, she asked intelligent questions and I really thought she had done an amazing job. Perfect person for this task. View My Photo Gallery of 33 photographs taken at Professional Development Day. Daniel and I agreed to help set up the Crochetville Booth. We were going to be helping on the show floor for 2 of the 3 days. We figured we best help set it up so if anyone asks us any questions, we could be helpful. We had great team work. I have to admit, Donna Hulka of Crochetville kind of alarmed me the night before the set up of the show about the attendance factor and such. Having worked for Creativ Festival for a number of years behind the scenes and as an exhibitor on the show floor. I was thinking that maybe the expenses I had spent to go to North Carolina may have been a wasted investment as I had spent nearly $1600 to go…. just being honest! Daniel and I had attended a smaller consumer show in Canada in 2011 where the entire show tanked. 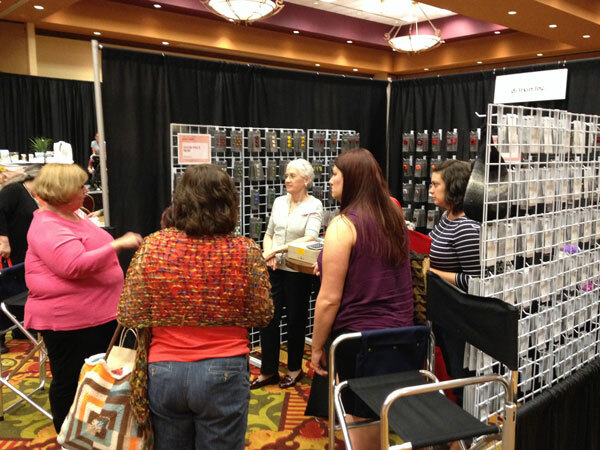 We had just a handful of guests and exhibitors packed up midshow and got the hell out of dodge. The show was called closed in the middle of the final day as not one consumer had shown up in the first three hours of opening. 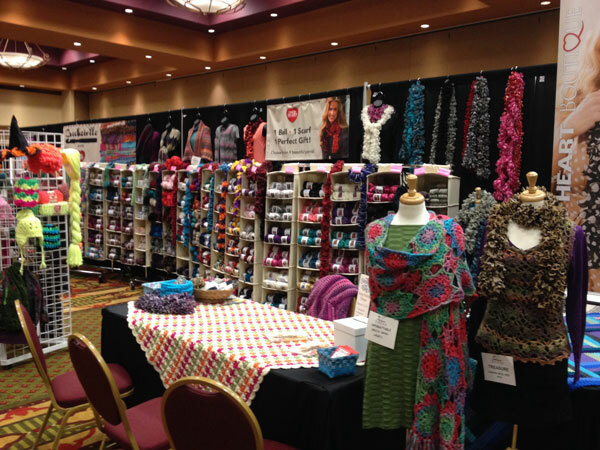 Crochet & Knit Show. Guests lined up in Lobby where allowed to enter. Concord, North Carolina. To my surprise, there was a Thursday night preview for all conference program attendees. This wasn’t open to the public. 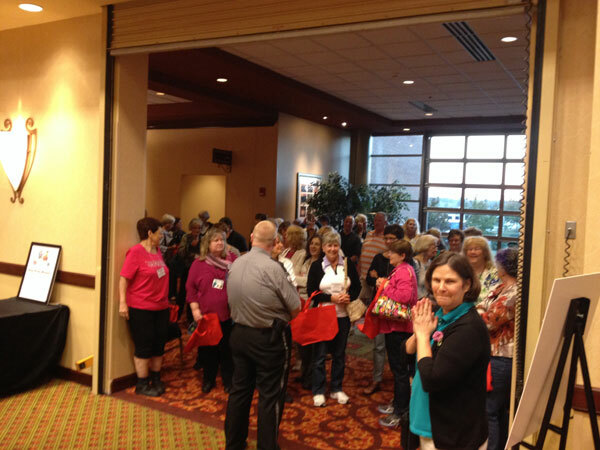 We had a fabulous lobby full of guests waiting to storm the show floor. 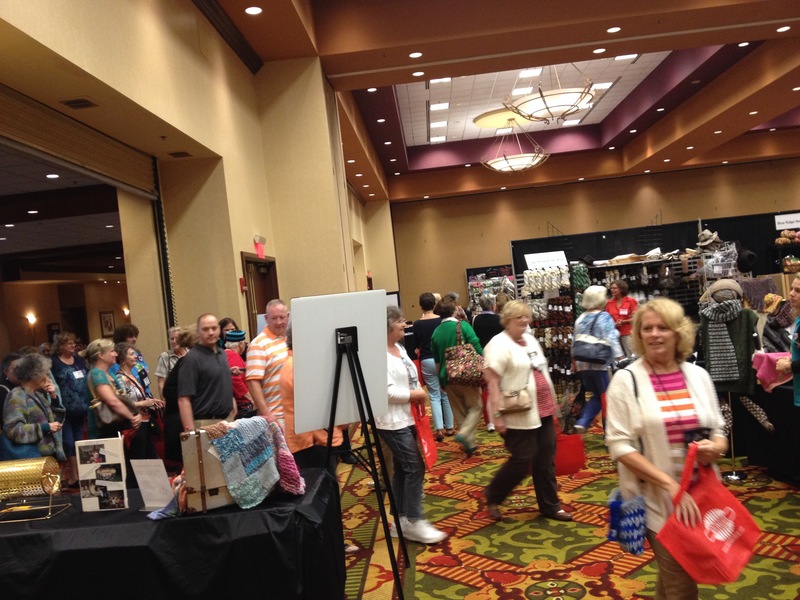 It kicked off a fabulous show where guests could view the Designers Challenge entries. Crochetville’s booth was hopping and fans of The Crochet Crowd, Crochetville and Red Heart were making our space busy and fun. I thoroughly enjoyed the connection between people. While on the show floor for 2 days, I met lots of fans. Incredible individuals which each a story to share. 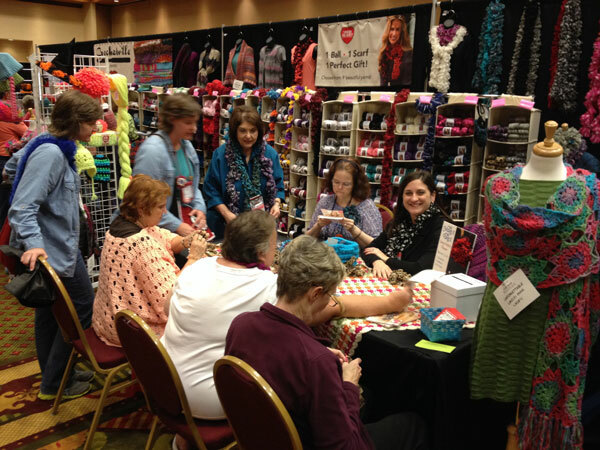 We shared laughs, some shared some tears and many just shared their passion of crochet. It was phenomenal. Stage Presentation. Fashion Show with Knit and Crochet Items. Thank you to all who attended to meet me. It was certainly a fabulous and lifelong memorable experience for me. The connection between professionals and fans made the journey and costs associated to going to North Carolina worth it. For obvious reasons, I cannot afford to go to every show that is held within North America. It’s a nice dream but it’s not financially doable. My dream show would be to attend Stitches West. I’m not going to get there in 2014 but maybe in 2015 if the show is still running, my budget allows it and if I have time. Many fans have requested that I hold these shows in different states or areas. For the record, I don’t have anything to do with the coordination, location and/or the administration of these shows. Like this show, I went at my own to experience an American Consumer Show. Locations and venues are determined by other people. I was given opportunity to speak publicly several times at this show but this wasn’t a venue that is designed around The Crochet Crowd. Tin Pan Arts, Buttons from Glass and Resin. Most inspirational booth to me was Tin PanArts from Mount Vernon, Washington. The artist was there and does hand made glass and resin buttons. By far, probably thee best unique looking buttons I have ever seen. I could have spent hours searching through her massive collection. I appreciate handmade artwork such as this. 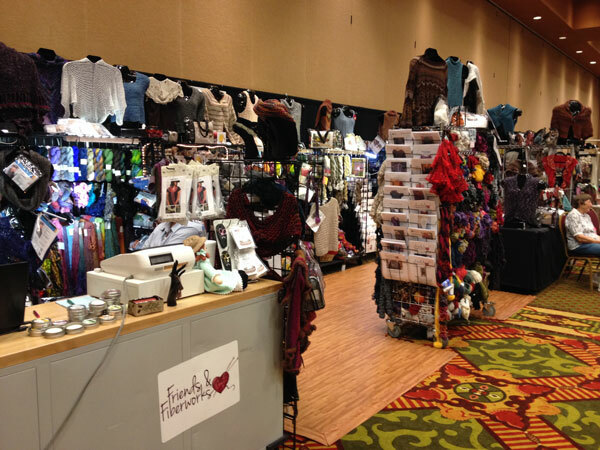 Most happiest booth was Friends & Fibreworks. They played dance music and had a team of energetic people on hand. Great selection from their real store too. Most likely made a difference in a child’s life was Di Irvine. The owners gave a package of custom made buttons to each one of the children of a family that had attended. This inspired the children to think about projects, yarn and more they could do with the buttons. This is where creativity begins. 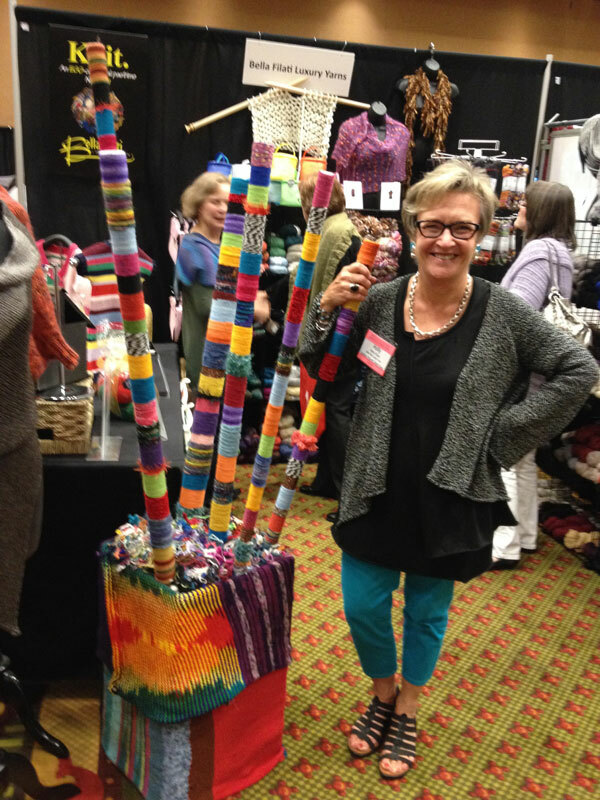 CGOA, Knit and Crochet Show. Bella Filati Luxury Yarns. Most innovative display without reason is Bella Faliti Luxury Yarns. They yarn bombed a sculpture just because they can. The owner was really pleasant and I can appreciate yarn bombed items. Mainly Crochet from Maine. Advancing Crochet to the Cyber world. Exhibitor that brought back what Christmas means to me what Mainly Crochet. 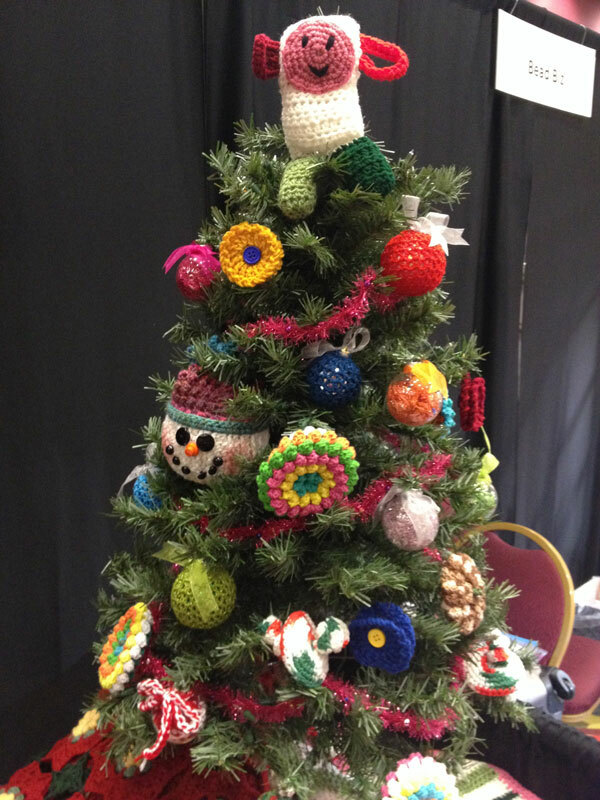 They had a stunning Christmas Tree with hand made crochet ornaments. I could have stolen this tree as it was so cool. 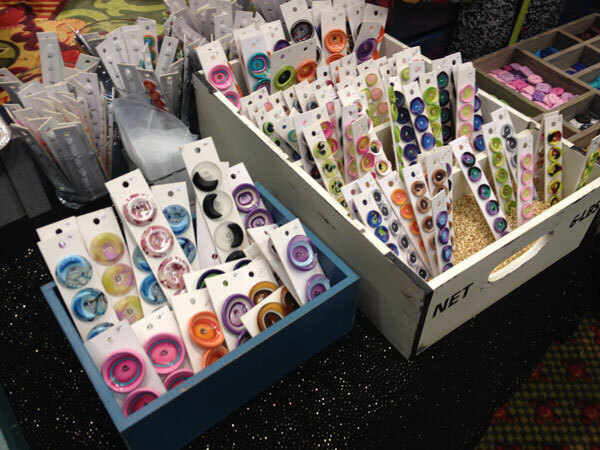 The busiest booth from my view point was Newton’s Yarn Country. With lots of tables with huge hanks of yarn. The yarn was unique, fun and interesting. Many guests had bags of this yarn in hand while coming to visit me. Over all, as a whole, presentations by all exhibitors were really well done and inspirational to different degrees. For an insider point of view of a professional wanting to design for crochet or even a passionate crochet enthusiast, this show was definitely worth it to me. New designers can meet and greet professional industry experts to pitch ideas, share and expand their own knowledge. While I was told that the attendance of the show floor was light. 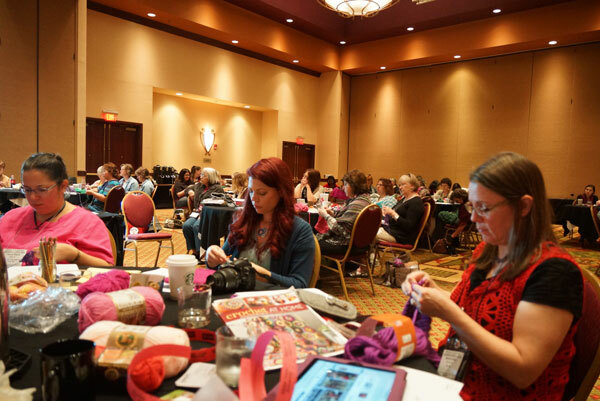 These events are vital to the future of crochet. As much as I enjoy the online communities of crocheters, these shows are so important as what we can learn over sharing a meal with other designers, sitting having coffee with professionals and engaging the public on the show floor cannot be captured through cyber relationships. I would attend this event again in the future. Just for the connections alone, the trip paid itself back! Oh yeah before I forget, Embassy Suits provided two free alcohol drinks in the evening and free breakfast with your stay each day. That was a nice money savings right there as well. They offered a free shuttle to the stores and restaurants within the vicinity of Concord North Carolina. That service was much appreciated as well. It was a great venue to host this event from my point of view. This entry was posted in Crafting Shows and tagged Concord North Carolina, crochet crowd, Crochet Guild of America, Crochetville, Mikey, North Carolina, Review, Show, United States. Bookmark the permalink. Call me anytime if you need a woman that can cut other people off gracefully. 😉 Nice to meet you, Michael. Looking forward to seeing you again in Manchester! I won’t be there. I have Creativ Festival not this weekend but next. My editorial schedule is too tight to make the Manchester Show. What a great article, Mikey. Thank you so much for sharing your pictures and thoughts of the show. I especially like that you spent the time to list all the companies that were there and their websites. Mikey, Donna and I really appreciate the help you and Dan provided at the Crochetville booth. 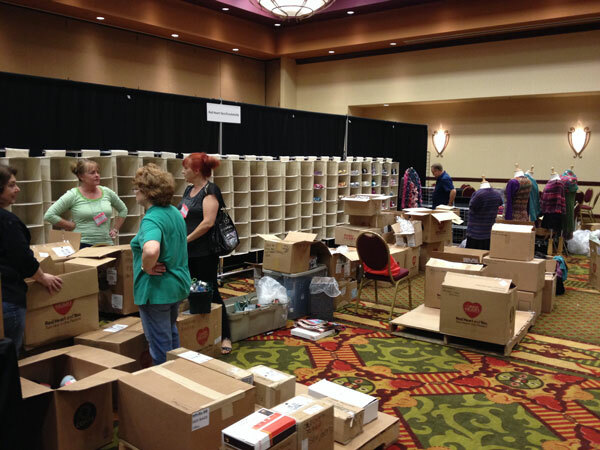 You did a fabulous job not only with set up, but with talking to customers about Red Heart yarns and products. So many attendees really enjoyed the rare opportunity to meet you both here in the United States. The Crochet Crowd + Crochetville + Red Heart Yarns is an unbeatable combination. Crochetville is looking forward to working more closely with The Crochet Crowd on some joint events and programs for crocheters in the not-too-distant future.